We’ve had so many requests for this granola recipe we thought we would add it to our blog. 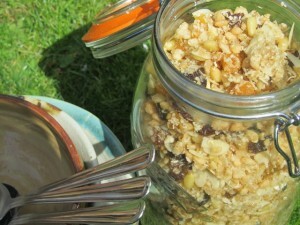 Many thanks to Julia who passed on this delicious granola recipe. It is perfect for group camping trips – all you need is to add some gorgeous fresh milk or yoghurt from the campsite/farm shop! Mix together 4 cups oats/4 cups rice crispies/2 cups pine nuts or sunflower seeds/1cup chopped apricots/2 cups raisins/1 cup unsweetened dessicated coconut/2 cups flaked almonds/1 cup sesame seeds. Boil 2 cups honey/ third of a cup of olive oil/ a third cup of soft brown sugar, simmer for 5 minutes. Cool slightly before adding to the dry ingredients. You can also make a delicious baked granola with your choice of nuts seeds and dried fruit. ruthwoolf July 5, 2013 October 25, 2017 Eat out!